The COPS squad at the East Region Short Course Championships. City of Peterborough Swimming Club (COPS) turned in an awesome team display at the East Region Short Course Championships at Luton to finish on top of the medals table. COPS ended the championships with their highest ever medal tally of 14 gold, 11 silver and 11 bronze medals and that was twice as many gold medals as their nearest rivals. The COPS squad consisted of 15 female swimmers and 14 male competitors and they qualified for 54 finals from 169 individual swims and took three relay golds, two relay silvers and one relay bronze medal. There were several notable performances with a 1-2-3-4 finish for the club in the women’s 200m breaststroke final leading the way. That was provided by Leah Roughan (17), Lauren Harrison (15), Amelia Monaghan (14) and Rebecca Burton (18). The club also claimed the first three places in the women’s 200m individual medley thanks to Mollie Allen (18), Burton and Poppy Richardson (15) and in the 400m event through Roughan, Richardson and Monaghan. And there was a top two finish for COPS in the women’s 4x400m medley relay with the A team of Rachel Wellings (16) Roughan, Burton and Allen taking gold and the B team of Bethany Saunders (17), Monaghan, Richardson and Anna Blakeley (14) taking the silver medal. Allen finished the day with a magnificent seven gold medals as she also touched first in the 50m and 100m backstroke and the 100m freestyle and was a member of two more victorious relay teams - the 4x400m freestyle squad with Wellings, Bethany Saunders and Roughan and the 4x800m freestyle relay team with Bethany Saunders, Richardson and Roughan . 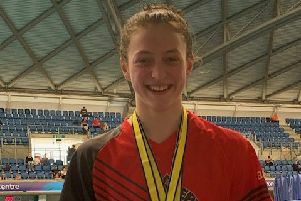 Roughan ended up with six golds with her other success coming in the 50m breaststroke and she also won a silver in the 100m breaststroke and a bronze in the 200m freestyle event. Burton was another multi-medallist adding an individual gold from the 100m breaststroke to her relay gold and finishing with two silvers and three bronze medals as well. Sixteen year-old Jamie Scholes (16) returned to form with a gold medal performance in the 200m backstroke final and three bronze medals in the 50m and 100m backstroke and the 400m individual medley event. COPS other medal winners were: Richardson - silver 200m butterfly, bronze 200m individual medley; Wellings (silver 100m backstroke, bronze 200m backstroke; Bethany Saunders - silver 200m backstroke; Mia Leech (14), Wellings, Madison Saunders (14) and Blakeley - bronze women’s 4x800m freestyle; Myles Robinson-Young (14), Tom Wiggins (17), Dan Leigh (17) and Jamie Scholes (16) - silver - men’s 4x800m freestyle. Also competing for COPS at the championships were: Jade Goode (13) Daniel Leigh (17), Emma Leslie (15), Yasir Naimi (16), Matthew Rothwell (14), Jaxon Simmons (16), Will Steel (15), Mackenzie Whyatt (14), Thomas Wiggins (17), Matthew Wouldham (15) and Eve Wright (13).